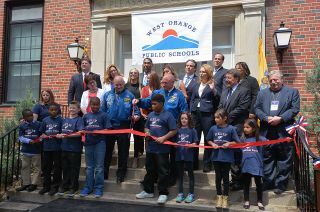 Astronauts Mark and Scott Kelly join students and school officials cutting a ribbon marking the opening of the newly-renamed Kelly Elementary School in West Orange, New Jersey, May 19, 2016. WEST ORANGE, N.J. — A New Jersey grade school launched its new name today (May 19) with the help of its honored namesakes — NASA's first identical twin astronauts. Mark and Scott Kelly, who 44 years ago transferred into the second grade at Pleasantdale Elementary, returned to West Orange, New Jersey for the renaming of their alma mater. Kelly Elementary School was dedicated to the two hometown heroes during an outdoor ceremony held on the front lawn the school with city and school leaders, students and teachers. "After all your worldly travels, and your out of world travels, it is my pleasure, on behalf on this community, to officially welcome you home," said Mayor Robert Parisi. "Thank you both for never forgetting where you came from." Kelly family members, including Mark's and Scott's father, Richard, and Mark's wife, former Arizona Congresswoman Gabby Giffords, attended the event. The school's renaming, which was unanimously approved by the West Orange Board of Education in March, honors the Kelly brothers as role models who can "literally inspire the students to reach for the stars," school officials said. "Let's all promise to learn like an astronaut," said Joanne Pollara, the principal of the school. "Notice, appreciate and share and applaud everything and everyone around us." Twin astronauts Mark and Scott Kelly stand with the-newly revealed sign in front of Pleasantdale, now Kelly, Elementary School in West Orange, New Jersey, May 19, 2016. Born in 1964 in Orange, New Jersey, Mark and Scott Kelly graduated from Mountain (now West Orange) High School, located across the street from Pleasantdale, in 1982. They were selected by NASA to train as astronauts in 1996 after becoming naval aviators. "This is a great honor, but I think it an improbable one because while we love this school, you know, like some of you, we were not always the best students," Mark said, addressing the children. "You can start out as a kid here — from West Orange, New Jersey — and not be the best pilot, at least not starting out being the best, and wind up commanding a rocket ship into space. Don't forget that." Mark Kelly flew aboard four space shuttle missions to help build the International Space Station, including launching and installing Japan's Kibo module, the orbiting outpost's largest habitable component. On his last flight 5 years ago this week, Mark commanded the final mission of the orbiter Endeavour. In total, he logged more than 54 days off the planet before retiring from NASA in June 2011. "Thank you for this incredible honor," said Scott Kelly. "We will never forget this. I remember just like it was yesterday sitting under that same exact tree right there doing artwork in our art class." Scott Kelly was on the International Space Station, nearing the end of an almost year-long mission, when he learned from his father that Pleasantdale Elementary School would be renamed for him and his brother. Also a veteran of four spaceflights, Scott piloted a mission to upgrade the Hubble Space Telescope prior to launching on two expeditions on board the space station. He currently holds the records for the longest mission by a U.S. astronau t t 340 days and the most time in space by an American at 520 days. He retired from NASA in March. "Both Mark and I are so proud to be part of this community and have this new connection now with Kelly Elementary School," said Scott. "We are excited about everything that you students are going to do in your future. So what I want to say to you is go reach for the stars and know that if you work hard and set big goals, and reach for the stars, that the sky is definitely not the limit." The Kellys are now among a small "crew" of New Jersey-born astronauts who have schools named in their honor in the Garden State. Mercury astronaut Wally Schirra, born in Hackensack, and Apollo 11 moonwalker Buzz Aldrin, from Montclair, have been similarly celebrated. In total, 12 astronauts were born in New Jersey, including the first American woman to walk in space, Kathy Sullivan, and two of Mark Kelly's STS-124 crewmembers, Ken Ham and Garrett Reisman. Editor's note: Space.com and its partner collectSPACE.com are media supporters of the Pleasantdale Elementary School renaming ceremony to honor the Kelly astronaut brothers. collectSPACE editor Robert Pearlman attended Pleasantdale while growing up in West Orange, New Jersey.